The 48.53 metre explorer yacht T6 has had a central agency change and is now listed for sale by Thom Conboy and Chris Collins at Ocean Independence. With exterior styling and interior design by Pieter Beeldsnijder, T6 was built in steel and aluminium by New Zealand yard Flyghtship to Lloyds class and MCA coded, with delivery in 2007. Accommodation is for 10 guests in five cabins comprising a main deck master suite, two VIP suites and two twins, all with entertainment centres, Samsung LCD television screens and en suite bathroom facilities. There are also quarters for up to 12 crew aboard this yacht for sale. The main deck saloon offers a comfortable seating area with two large sofas, four leather armchairs and a leather ottoman around a custom glass topped coffee table. The entertainment centre is housed in a cabinet and includes a Samsung 55 inch LED television screen and a Marantz stereo surround sound system. Forward, the custom-made teak dining table provides seating for 12 guests and glass bi-fold windows extend around the aft of the dining area. Double stainless steel and glass automatic sliding doors open aft onto the main deck aft dining area. 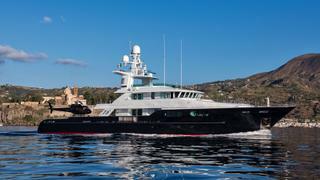 Major features include a dedicated helicopter hanger with fuel storage and a massive tender garage. The Airbus AS350 B3 helicopter is also available for sale under separate negotiation. Twin 1,448hp Wartsila diesel engines give her a range of 7,500 nautical miles at her cruising speed of 11.5 knots and she is fitted with Koopnautic zero speed stabilisers. Available to view in the Free Trade Zone at Rybovich Marina, Fort Lauderdale, T6 is asking €19,950,000.